The Battle for Xilos is coming. Are you ready? 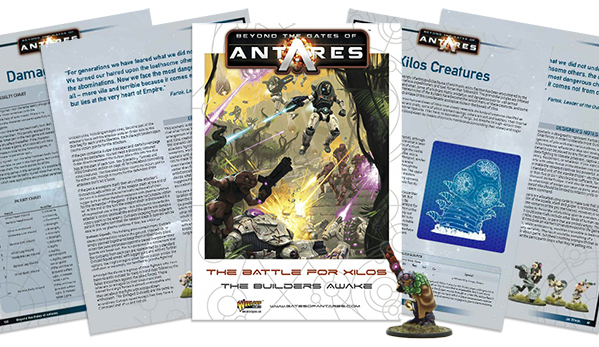 The first supplement expansion for Beyond the Gates of Antares takes players to the planet Xilos, where everyone's looking to get what they can for themselves. Warlord is also coming out with some online resources for you when you play the various scenarios in the book. They're also going to be launching an online campaign. The online campaign closely follows the events in the book (though you don't necessarily need the book to participate). Each week, a new episode of the campaign will open up. Players can report their games on the Warlord Games website and have them count toward whichever faction they played. Winning factions will open up bonuses further into the campaign. But once a bonus is won, it's not guaranteed forever. Other factions can come in and take them for themselves with wins as well.